: Hey all! We've got some feedback updates for you on some of our Invictus Gaming skins! Camille: Camille's passive VFX has been updated! https://imgur.com/a/EogD32W https://imgur.com/a/AP4owBh https://imgur.com/a/66vong0 Kai'sa: Kai'sa's shield has been darkened! https://imgur.com/a/LxVf4zo LeBlanc: As mentioned by Riot Beardilocks, Leblanc has darker makeup added to the splash and model. Please let us know if you have any further questions or feedback. Thanks! : PBE Bugs & Feedback Thread: K/DA Evelynn Prestige Edition! in > PBE Bugs & Feedback Thread: K/DA Evelynn Prestige Edition! I really wish her hair was a red/orange/pink-ish tone like Prestige K/DA Akali. I feel like it would be much more cooler and make more sense to have duos of two blondes(Kai'Sa and Ahri) and two "gingers"(Akali and Evelynn) than just 3 blondes with only Akali standing out with a different hair color. Irelia's boots in-game have two tones of grey, a lighter one on the "inside" with some darker patterns around, and then a part of the pattern goes all the way down to the bottom part, where her feet are, and it's all dark there. While on the splash art they're all white, like, in the same tone as her dress(even the lighter tone on the boots doesn't match with the dress in-game), the darker partners are only there on the top while the bottom part with her feet are white, or at least the same as the light parts while only the little "heel" is a dark grey. https://i.imgur.com/ybOFQAX.png/img] I like both versions but either one or the other should be tweaked for consistency. : Pentakill Kayle Splash Art is missing one thing. in > Pentakill Kayle Splash Art is missing one thing. Pls Riot x.x I know it's not a big deal, but... 1 - It's an actual inconsistency rather than just a "I wish it was like that" kind of thing. 2 - It's SUPER quick to do! There's still time. 3 - Well, it does look better with it imo, though as I said on #1, that probably shouldn't be the main factor lol. : Correction, it's missing two things. The in-game model has her with pointy ears. The splash does not. Heads up Riot. Also, the in-game face model looks nothing like this whatsoever. Even from a distance she looks alien. the face needs work in general. It doesn't match _any_ of the skins except the base. Oh I hadn't even noticed the pointy ears. Would be nice if Riot added that too. Though I feel like that's something even smaller and more hard to notice than, well, the whole black collar/choker/fabric thing on her neck being missing. About the face, I don't think Riot really tries to match facial features between art and model much, as it's more of a matter of art style. So, a lot of people are using this to give feedback about her skins and stuff, so, I'm gonna do the same, sorry if I really shouldn't. So, about Pentakill Kayle. This is actually an issue that was already there before the rework and has always bothered me, but, Kayle is lacking her... Collar? I'm not sure how to call it, but, on her model she has this kind of acessory on her chest with a black fabric or so around her neck. Except that on the splash art she doesn't have it, her neck is naked. I think it looks better with the black thing around it, and besides that I also feel like this really should be changed because it's not just something subjective but an actual inconsistency between model and art. A little edit to show it: https://i.imgur.com/3BIy325.png[/img] https://i.imgur.com/Kktg2ta.gif[/img] [Full version gif comparison](https://i.imgur.com/XamFvBa.gif), [Still splash edited](https://i.imgur.com/rYfSY5p.jpg). Pentakill Kayle Splash Art is missing one thing. Is there no thread for feedback on her skins? Put the dead black flowers on it instead of the red ones. So, I think you guys might be using a wrong/outdated texture for Ezreal? I remember that, when his rework was first teased, his face on Star Guardian looked a bit weird on the rework trailer video, a loot more older and sharp than on all the other skins. Whoever was responsible for his rework's skins fixed it before it went to PBE(they said so on Ez Mains reddit), and the skin has been fine like that ever since. Now looking at the picture for Pajama Ez, I instantly thought it looked a lot like that original trailer version. I went to both his skin spotlight videos, and I think I'm right. This is his current face texture: https://teemo.gg/model-viewer?skinid=81018 I think this should be fixed/changed not only so that the skins match(not sure if that's supposed to be a priority or not), but really because his current face is really weird and doesn't fit Ez, especially on a cute pajama skin like that. It did get FIXED(with those words rather than "changed" or "updated" for a reason. : PBE Bugs & Feedback Thread: Lunar Eclipse Leona! in > PBE Bugs & Feedback Thread: Lunar Eclipse Leona! I think her ult VFX feels a bit underwhelming when compared to Solar. Besides that, those two are just perfect! First of all, I'm so glad about the new discount, thanks for listening. Now, sorry that this is probably not good feedback again(sigh)... But why did you guys chose this specific group of champions for this? Like, why not just one of the teams and then the other later one? Or even just not another random selection? I really wanted a Jinx one x.x And I ship her and Lux on this line so even if she gets one later, I really wanted them together on the shared splash x.x Sorry for the lowkey rant lol. : Hello again everyone! After considering your feedback and talking together as a team, we have decided to make a price adjustment to the Variants. PBE is always a forum for us to respond to your feedback. This is especially important when we’re trying out new products. We put a lot of thought into the 30% discount: including running player labs, number-crunching, and looking at the effort our artists put into the skins. We still believe in the value of these skins. That said, we hear you: 30% feels bad. So we’re changing it. Both Eclipse Leonas and Pajama Guardian Variants will be discounted now at 45% if you own the other one. So, if you own one Eclipse Leona, the other will cost 1001 RP (2821 RP for both). If you own one Star/Pajama Guardian, you’ll get its counterpart for 742 RP (2092 RP for both) Again, thanks for your feedback on this one. It matters, and we appreciate it. That skin and those like that are old and were made before Riot changed their policy. From around 2013 or so, they decided that from that point on, all skins that didn't change anything but the model were 750 and 975 were the ones who had at least VFX differences. There's no such thing as "the model looks more detailed". 750 skins don't have a objectively better or worse models. They're supposed to be the same as the other skins except that they don't have new VFX. Just like Pajama variants don't have new VFX for people who already have the original Star Guardians. The price is only too expensive for those who already own them. As I said on other posts: 945 RP for people who already own the original skins is way too much. Skins that only change the model and splash art are priced 750 RP. And those actually come with a completely new design, not just an old one with different clothing. 1350 for people who don't own the original is fine. But for people who already have them, they already payed for most of the content that those are offering. Those should be 750 maximum. : The asking price of around 900 RP is absurd. For around the same price someone could buy Justicar Syndra, BM Evelynn, or even Crabgot which have vastly different particles and models. Rebuying the same skin for such a price doesn't make sense. The base price without the originals is fair, but paying so much for some edits to skins we already own is just a no. Using wishful thinking, I'd love them at a 520 RP price, but 750 RP is fair. I think 520 could be fair too if you consider that the designs are already super similar, while other 750 RP skins have a completely new ones. But considering only the "different model = 750 RP" logic, 750 seems fair. Just not 900 like they're charging lol. : Thanks for the feedback. Not to get to technical, but there is significantly more work on these than in Chromas. Chromas are just a texture re-color, For the Pajama guardians they are getting a full new model, which also sometimes require tweaks to the rig and animation. For Leona she has a different recall, models (both base and after the ult), and VFX set. As I said on another comment: Skins with complete new models, but no new VFX/SFX, traditionally cost 750 RP. Not 945. This discount is still too low, even if we're not comparing it to chromas. The Star Guardian variants are way too expensive for people who already own the original ones. It's the same effects and VFX. It should be at least 750 RP. That is how much skins with new models but no new effects have always cost. I don't see why should those be any more expensive, considering the designs are even more similar than usual 750 RP skins(again, I mean for people who already own the traditional Star Guardians). : > I'd like to point out two things real quick; first of all, just "trash the skin" isn't constructive. Constructive is about "i don't like X for reason Y, and Z is how I think it can be improved." Exactly this. While yes, 'this is trash' shows your distaste with a skin, but if we're going to ship the skin (which 99% of the time we do), we'd like to know what specifically you don't like so we can discuss potential tweaks. If nothing else, it can help us better inform the choices we make for future skins. > Secondly, it's great that Fairy Flan is showing interest towards what the LeBlanc mains would rather see, but it's much more likely to see one of those suggestions become a new skin in the (potentially far away) future and not a replacement of the current Program one. That's correct, we aren't scrapping Program LeBlanc for another skin, it's more of a question of what would you like to see in the future if robots aren't your jam. > I've been trying to find the "Sewn Chaos is cancelled" thread, but if I recall correctly Riot mentioned they were already far in the process of "hey are we cancelling these?" by the time the skins hit PBE. There were talks prior to PBE about if these were hitting were hitting the quality bar, yes. It was something that we admittedly should have called out/discussed sooner, before it hit PBE. > Edit: don't get me wrong, I don't mean to take anything away from the concerns you raise. We all have opinions and we all deserve to be heard on them - I just feel like opinions have to be clarified as much as possible. 100% agree with this. Please share your thoughts, but be specific in your like/dislikes! in > PBE Bugs & Feedback Thread: Program Nami! I think that what makes people most upset, in LeBlanc's case more than Nami, is that they feel like now they're probably gonna have to wait years for a skin they actually like. They had to wait years for her to be reverted already, and now that she is they're all passionate about playing her again, and so a new skin for her is something that they have been anticipating and that should have been a great moment. But then you guys made one with a theme that doesn't resonate at all with most of her playerbase, and it really feels like a blow in the face. in > PBE Bugs & Feedback Thread: Program LeBlanc! I think you're trying to say "That skin doesn't match LeBlanc". "Combine" is not the english translation of combina in portuguese. : PBE Bugs & Feedback Thread: Program LeBlanc! Unfortunately I guess I don't have any useful feedback for the actual skin... Basically, I just don't see how Riot thought Program LeBlanc was the best idea... And I mean in both "Why LeBlanc of all people for the Program line?" and "Why Program of all lines for Leblanc?" ways. Does Riot just not think about the audience for a skin at all? Something like "I guess Star Guardian would be popular between Ahri players"(Mentioning a supposedly good fit here). This really got me thinking. I don't think LeBlanc mains are into this theme at all. If you ask any LB player which skin they would have for LB like, yesterday, no one would say Program. You can see a lot of discontentment on reddit and other social media, there's probably more people disappointed that she's more likely not gonna get another skin for a while now than people actually excited for this. And, I imagine the people who are into the Program line(who I feel like it's not that much people, this line is far from being on Star Guardian/Project/Arcade/Pulsefire level of popularity) is also not that into LB. Frosted Ezreal should get new(or at least recolored) VFX. "Boring-looking" it's a weird idea. Purple, at least on that tone, it's still a pretty vibrant color. Gangplank's gun matches the colors on the skin. Do you think that's boring? The huge pink part doesn't match the rest of the skin, not only on the literal sense that there's no pink on her outfit, but that the pink feels weirdly out of place when put right next to her model considering all the tones on it(hair,bikini,accesories,skin). Zoe's skin has lots of different colors on her body, but here, it's just the gun. Instead of the whole skin feeling like all like a rainbow, it feels like the gun it's a totally separate piece instead of part of the puzzle on the whole thing. AND you can barely see it on the splash art. : PBE Bugs & Feedback Thread: Pool Party and Headhunter Akali Chromas! in > PBE Bugs & Feedback Thread: Pool Party and Headhunter Akali Chromas! I feel like Rose Quartz Caitlyn could have the same hair color as Rose Quartz Taric, this sort of grey-ish blonde. I think it fits the pastel colors very well, matches with another chroma from the same "line", and Catseye and Aquamarine already have some brownish tones, while a lighter one like that is missing(the Ruby's hair is like suuuper yellow, not really the same). : We felt this was most appropriate for her in this particular thematic, they're all ready for battle and off for adventure. : Hi hi! I appreciate the feedback! Happy to provide a bit of context around these. > EZREAL: Welp, the concept art looks like more... Clean? Like, the blue hair is great, but, he fits more with an lighter hair, like the blue ezreal ~chroma~ skin. Maybe a Light Platinum hair style fits better on him. We felt there was a big overlap with Frosted, another skin with a blue outfit and light hair. The concept in this case was purely directional and was what we showed to the players super early on to ask if what we had concepted matched with what they had in mind. > TALIYAH: The most beautiful model, the worst one with effects. 1- WHERE'S THE SFX???? SHE USES THE BASE SFX??????? REALLY? Rakan's one uses A LOT of SFX, and a skin i've been waiting FOR YEARS have less custom sfx than the Freiljord one?? 2- The VFX for the passive and ultimate was great! But, i feel the Q and E doesn't have "blue things" enough. She REALLY needs something "lighter", something that will bright more than her blue and fantastic scarf. The model of that skin doesn't match with de FX, and doesn't like to be priced with 1350 RP, like the Xayah/Rakan ones. She does have custom SFX. If they're playing base, this is a bug. > XAYAH: DELIGHTFUL, REALLY DELIGHTFUL. i'm the globglogabgalab, i love books. The best xayah skin since today. BUT, like ezreal, hair it could be... Dark blue, or a lighter blue. White hair didn't look great with her. We heard player feedback last time on the Sweetheart skins that they were too opposite and should match more. We were hesitant because they have similar cape reads. We pushed them closer together, but for the sake of having them still be clear as to who was who at a glance, we opted to give Xayah white hair. I'm one of those people who wished Sweetheart Rakan and Xayah matched a bit more, and I'm glad that this time they're closer! Thanks for taking that into consideration. Ok, I looked at the concept art and compared now, and I have a question... Why does Xayah have her legs covered? I don't understand. I think the skin would look better if it showed a little skin. She's like covered from head to toe, nothing you can see besides the face... I think it would add a more feminine touch and even make things more clear on the design(I think it actually seems kinda hard to even realize she has pants, when she's already covered in blue on the rest of the outfit). I know you can't change the color entirely, but I think Xayah's ears could use just a little more blue. Make it more gradient, instead of just a blue tip at the top, which is what it looks like now and it's kinda weird imo. : PBE Bugs & Feedback Thread: Profile Background Picker! in > PBE Bugs & Feedback Thread: Profile Background Picker! Could the current backgrounds for ultimate icons be lined up with these? Lux and Sona look much better with this than with the icon equipped. : Hey friends, sorry I'm late, I didn't mean the changes to blindside anybody, here to explain why: About the horn changes we agreed on what most of you guys said about it clicking too lunar wraith-y and felt having a more gold would not only reduce that vibe, but give it higher Blood Moon resemblance. Thanks for letting us know! About the white/off-pink hair, we considered this but like I said yesterday, it blends in with Blood Moon Eve's paler skin too much at game height. About adding kimono sleeves, we also considered this but admire her current short kimono: Japanese-style wrap with obi sash and back ribbon. Also adding kimono sleeves would takeaway from her demon hands/claws -- too much going on. Thank you so much for all the feedback and really sorry not all of you are happy. I promise we tried our best, we took a whole day's worth of dev time if not more mulling over feedback, including trying them out. We really like how she looks now and fits into the Blood Moon thematic. So, I really like the changes. The new horn and hair colors look great imo... The only thing though: Shouldn't her lashes be updated too to match the very red hair now? I feel like those two colors matching makes the skin all more... cohesive? It felt a bit eeehh with the more pink tone, but the red tone now really pops and I think it would make it all more appealing. : Dropping the mana regen on frostfang and making tear cost more is gonna be pretty rough for Sona... I'm sure the other supports will be fine, but man, that's a little too harsh on Sona with no compensation. : keep in mind they also work on making bot lane not adc only place. So it'll impact adc too. But this thread isn't related to adc. Don't get emotional when its still in test. It's stupid to make bot lane not adc only. It's either just not gonna work or be completely terrible for ADCs. Yeah, sure, let's just destroy mages completely. I'm sure that won't have a negative impact. And also, screw all the AP supports with it, great. No, don't get rid of the exposed chest on the sides!!! Maybe make it more of a square shape, but don't cover it completely. Monday and still nothing x.x C'mon guys. List of the reasons why I think this has to be added: 1 - It adds consistency to the splash. 2 - It adds something interesting to the skin(headphones) that the others don't have. 3 - It fits the new design of Infiltrator, with this kind of eletronic vibe. 4 - The dark black/blue colors with silver on the edges look better than just plain silver, as it matches with the rest of her costume. 5 - Her head/hair looks better with something on top of it. She needs that buff though. She doesn't have enough damage, and the only reason she has a good/decent winrate is that the movement speed on her Q makes her really easy to survive and escape. That's why they're taking that away and buffing her damage. : I kneeeww she was lacking something but didn't know what and i think that's it! Right? It really makes all the difference imo. 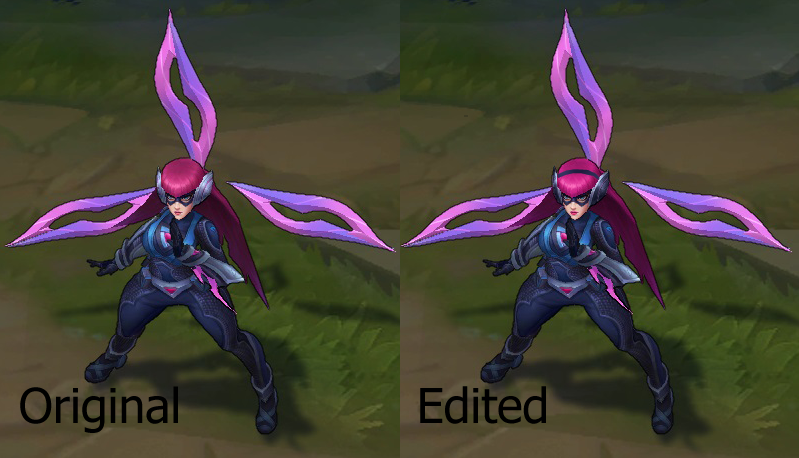 So, I love the new Infiltrator Irelia, but, when I first saw the model after being so excited with the splash art, I knew something was off. So I looked and found what the big difference was: The headpiece. On the splash art, they're like headphones, with a line on the middle to connect them, of course. In-game, they're just like Irelia's normal headpiece. On the splash, they match the black/grey tone in her costume, with a silver line at the edge, while in-game they're purely silver. I think the splash look is a much more cool one, so I made a little edit. https://i.imgur.com/VVOZyv3.png[/img] Besides that, I also made the colors on her hair and lips a bit more like the splash, though this is not as important. I think those changes make the skin much more appealing and with a stronger theme. And it also adds consistency to the splash. Is there gonna be a feedback thread for the skins? Or should we post it here? I sent it to LoveStrut on Twitter. Whether it's intentional or not, hope it can get fixed/changed. in > PBE Bugs & Feedback Thread: Gun Goddess Miss Fortune! I like the icons and the new idle animation, thanks! Don't want to be greedy, but if she could get one or a couple more anims, that'd be really great. Also, like others have said, some freckles would be nice. They're not visible on the animated splashes and icons, what I imagine is a little mistake, since they're there on the normal version of the splash. Plus they're not in the model at all. I think at least Scarlet Flair should have it. I'm fine with the others not having it because it makes the forms more different from each other. Could you say whether there are any changes on textures and such? Can't check it now.